Sorry to report Max Passed away today 6th January 2018. John Maxwell Collie was born in Melbourne, Australia on 21st February 1931. He first heard professional jazz in1946 listening to Graham Bell’s lunchtime concerts at The New Theatre Melbourne. By 1948 he was playing with a local band and shortly after, leading it. 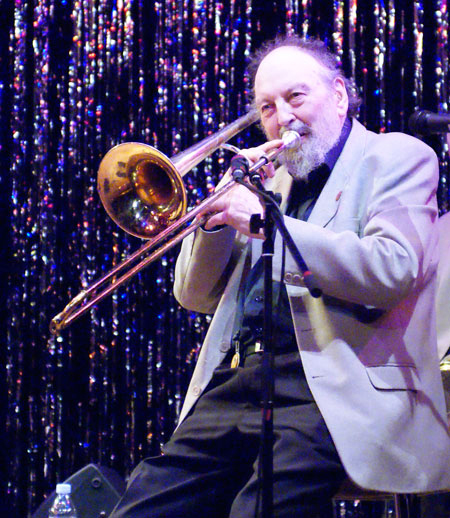 The famous Melbourne New Orleans Jazz Band were on tour in Europe and Max received a cable offering him the trombone chair, so in April 1962 Max arrived in England [to coincide with Beatlemania and the collapse of the British Trad scene] to tour Europe until that band went back to Australia a year later. Max decided to stay and joined the London City Stompers, becoming leader after a year, until February 1966, when he formed Max Collie’s Rhythm Aces and that band, notwithstanding the collapse of the UK jazz scene, went on to become world famous. Max was simply a great band leader and got the best out of everyone, converting them to his unique sound. He knew that no group of artistes no matter how talented as individuals can bring forth the authentic New Orleans style if they can’t work together day after day as his band did, as the last of the touring bands. He was able to get his highly professional and experienced musicians as though by magic to play the style and the way he wanted and achieve the level of musical perfection required. In 1972 Sam Johnson, an avid jazz fan, whose stepfather had the longest running jazz radio show in history and whose uncle was President of the USA, started following the band. Sam Johnson became the American Tour Manager and with Martin Ross overall manager, led Max into a different world, first with a 25 days tour of the USA, then a 45 day tour, then a 66 day tour and finally an 84 day tour. All unheard of for a non US musician and the nationwide USA success of these 220 US appearances led to Max winning the World Championship of Jazz in Indianapolis against the cream of North American jazz bands. 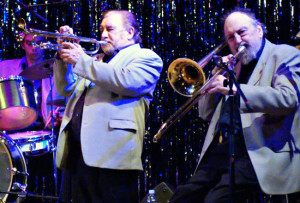 A total of 44 states were travelled by band wagon and most jazz festivals and clubs across the USA were played, along with many TV appearances and countless radio shows. Terrific publicity followed this success in the jazz world and tours of Sweden, Denmark, Norway, Finland and Japan were added to the regular European itinerary. The Bands only ever Manager Martin Ross, persuaded Max that it was time to take advantage of his new found fame and do a Theatre Show called simply “Max Collie’s New Orleans Mardi Gras”, which although a vehicle for Max also included the legendary Ken Colyer and Cy Laurie and turned out to be the most successful jazz show in British jazz history performing approximately 700 shows across every major venue in Britain. Max had now played over 3500 major jazz festivals all over the world from Antibes to New Orleans itself, 1200 theatre concerts, countless jazz clubs and made 50 recordings many of which are now collector’s items, plus DVD’s and 100’s of TV and Radio show appearances. John Cherry, Chris Marney, David Bashford, George Walker, Dickie White. Alan (Slim) Poston, Baby Jools, John Petters. Piano: T J Johnson, Lord Arsenal. Marilyn Middleton Pollock, Pauline Pearce. USA Tour Agent/Manager: Samuel S. H. Johnson. Be sure to visit “Time To Give Back To Max” for many more tributes to the Great Man. So sad to hear this especially as we lost Trefor Williams a couple of months back! The days with Max were the happiest of my life. I hope to see him again fronting the heavenly Jazz Band. He had great bands and remained a great guy through it all. I hope to attend the memorial tribute to Max that my friend and fellow manager Martin Ross is organizing soon! Just to say how sad it is to hear of Max’ passing. I roadied for Max from some time in 1979 until 1981 having taken over the job from my best mate Phil Burnell, who also passed away in May 2015. I moved on to work with Monty Sunshine, Terry Lightfoot and Kenny Ball but, when commitments allowed still did the odd tour with Max. As Tony said above Max, and his manager Martin Ross, were always hustling to get the band work, I lived at Chez Collie for about a year and Max would be downstairs in the office at his Bromley home all day, sometimes seven days a week, including Sundays, on the phone getting gigs for the band, I hate to think what his phone bills were like. I had worked in the rock music industry prior to getting into the jazz scene via Bob Kerr and first saw Max when Phil Burnell started roadying for Max. He called me and said ” you’ve gotta come and see this band I’m working for, they’re great”. They were playing at The Red Lion in Barnehurst I seem to remember and had what, in my opinion, was Max’s best band with Phil Mason, Jack Gilbert, Ron McKay, Trefor Williams and Jim McIntosh and I was completely blown away by the energy and musicianship that day and when Phil Burnell decided to leave I jumped at taking the job on. My first gig was in Holland at the Breda festival. We did four nights there and the venue was absolutely rocking. There were so many jazz festivals in Holland in those times and I think we did most of them over the years and Holland loved Max Collie’s band especially at The Enkhuizen Festival which I think I’ve worked at about 11 times with Max, Monty and Kenny. Max was there just about every year by demand from the organisers over the early years and every venue we played was packed out. Max loved playing and would take a gig anywhere that doable. I remember on at least three occasions playing at Cole Mathieson’s Concorde Club in Eastleigh, near Southampton and going directly to Dover to get the 5 am ferry to Belgium and then driving directly to The Cotton Club in Hamburg, a 10 hour drive, just in time to go straight to the gig to set up for an 8.30 pm gig which would go on until 1 am. These sort of schedules were not unusual and Max had had a Fiat band bus specially built with 8 beds in it and toilet, wash basin and fridge in the back section, it even had a working TV. The band, especially Trefor spent a lot of time horizontal while travelling. Max ws a great band leader and got the very best out of all the musicians he used over the years. He also loved giving the younger guys a chance and people like T.J. Johnson, James Evans, Paul Harrisson and Jonny Boston would all pay tribute to Max for helping them on their ways to a career in music. I last saw Max a couple of years ago when Trefor, Martin and myself went to see him at The Sycamore Care Home in Brighton and it was painful to see the man almost bed ridden and rambling on about how he was finding it difficult to get the band gigs, Max new nothing else. Martin called me before this Christmas just gone to see if I wanted to go and see him but after talking to the home’s management to hear that Max’ eyesight and hearing had just about packed up we decided to review the situation in the new year, but it wasn’t to be. With Ron, Jack, Phil and Trefor waiting for him there’s that great band, wherever they are, ready for bookings with a great band leader ….. So Max … we didn’t always see eye to eye but over the 35 years I knew you I always respected you and it was a great experience for me to work with you ….. Thank you for the music and R.I.P. my friend.. I sat in twice with the band in Holland – Max was totally relaxed about that. Fabulous memory! Be sure to visit http://www.jazzandjazz.com/2013/07/urgent-appeal-for-max-collie for many more tributes and comments. To all jazz musicians and jazz supporters. The funeral of MAX COLLIE will take place on 5th February at 14.00 in North Chapel of Woodvale Crematorium, Lewes Road, BN2 3QB. Martin Ross has asked me to arrange a parade band for the occasion so musicians willing and able to participate, would you please reply to this and/or phone me on 07801232496so we can give the old bugger a great send-off. My dad used to see Max every time he played in Manchester. Had him on cassette as far back as the mid 70s! Just found out that Max Collie is no longer with us.. Did a few months as his Roadie back in ’97 or ’98? My very good mate Robert Cotterill was the drummer at that time, and it was his dad Pete, who suggested to Max that I could be the temporary ‘stand-in’ he was looking for. Bit of a disaster; Pete didn’t tell me I needed to be handy with a soldering iron, and Max never asked. Had a short fuse did Max. Ok on the driving, and sound checks etc, but totally out of my depth with all that electrical stuff. Totally out of touch with the jazz world nowadays, knew Phil Mason had died, but didn’t know Trefor Williams had gone too. There aren’t many old ‘uns left to have a closer walk with. R I P max Collie. Great men.